A documentary that follows the street photographer JR as he travels to small towns in France in his van, taking portraits of everyday people and pasting the gigantic pictures onto buildings, has been nominated for an Oscar. 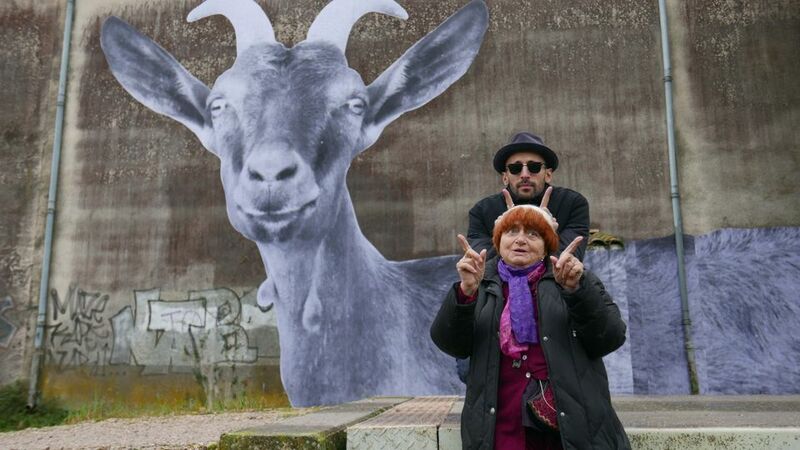 Faces Places (Visages Villages in the original French) is a collaboration between the Belgium-born film director Agnès Varda and JR, who rose to fame during the Paris riots of 2005, when an image he had stuck on walls in Les Bosquets housing projects a year earlier became the backdrop to the civil unrest. The unscripted documentary magnifies the lives of ordinary people–a woman who stands her ground to defend a row of miners’ homes that is about to be demolished, a goat farmer who lets his livestock roam free, dockworkers who are members of a famously militant left-wing union. The majority are white. Some are likely supporters of France’s far-right National Front. Around half way through, Varda becomes the film’s central character. Her deteriorating vision is documented as she undergoes an ophthalmological exam and eye injection. The movie, which was awarded the 2017 Cannes Golden Eye documentary prize, goes on to recount Varda’s own artistic history and the influence of director Jean-Luc Godard on her work. At one point, in a reconstruction of the famous scene in Godard’s film, Band of Outsiders, JR is seen running through the Louvre pushing Varda in a wheelchair.